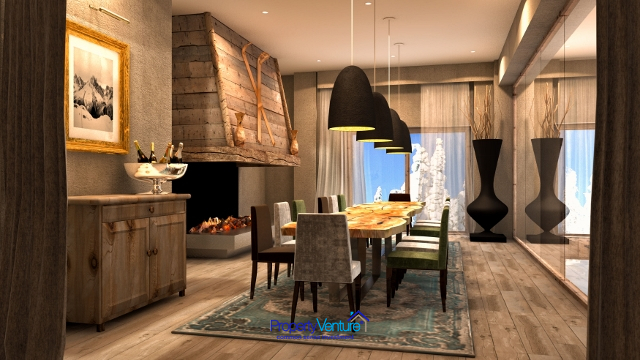 Would you love to buy your own ski apartment in a high-profile resort like Courchevel? And earn a bit of money from it? Well these might be the answer for you to get the best of both worlds, a ski pad, managed for you, with income so it won't drain the bank account. At the heart of the 3 Valleys - the biggest skiable area in the World. In a much sought-after spot, Courchevel is the 9th busiest ski resort in the World. Partly owing to its reputation for great ski quality across the 600 km of pistes of which 150 km area around the Courchevel resort, as well as its longevity as a ski resort. Popular among families because of its range of family entertainment and activities. 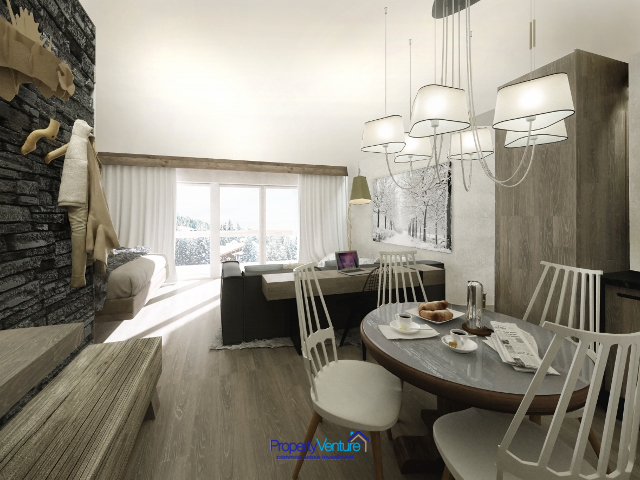 The Courchevel ski resort is made up of 5 villages, all easily-accessible: Saint Bon, at the heart of Courchevel at 1100m, Courchevel Le Praz at 1300m the charming village, Courchevel Village 1550 with a young vibrant feel, Courchevel Moriond 1650 with a festive ambience and Courchevel 1850, the jewel. 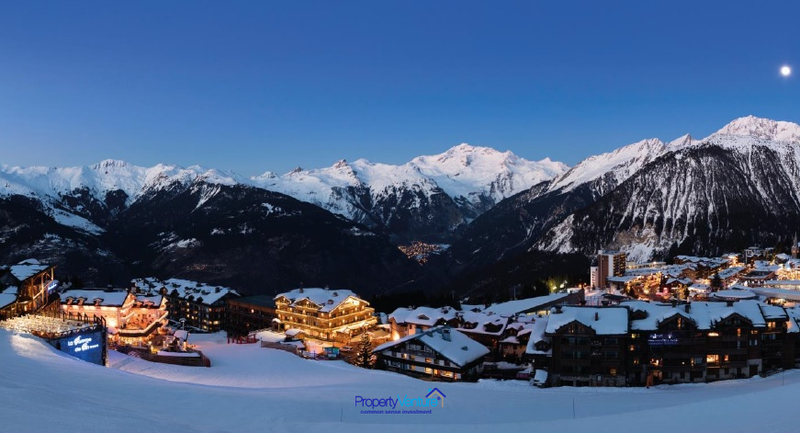 The ski area incorporates 8 resorts: Courchevel, La Tania, Méribel, Brides-les-Bains, Saint Martin de Belleville, Les Menuires, Val Thorens and Orelle. 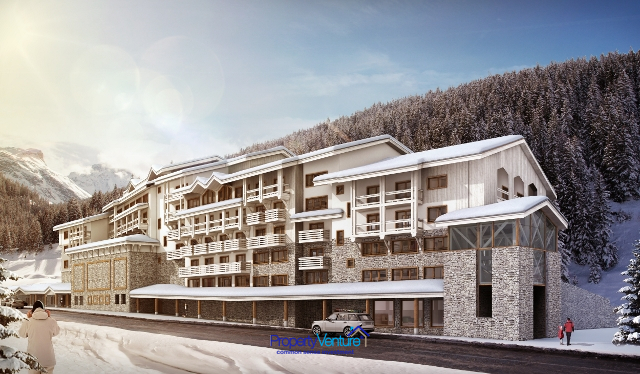 Between Courchevel 1650 and 1850, the spot of these managed units is right next to a new 8-man ski lift and opposite the ‘Grandes Combes’ l’Aquamotion, the water sport park. This is a 4 star hotel with accommodation, using the high quality hotel services. In terms of archtecture it is a building which draws on all the local materials, reflecting the character of surrounding mountain architecture. It will incorporate warm materials, with a stone wall façade, wooden features and a slate roof. 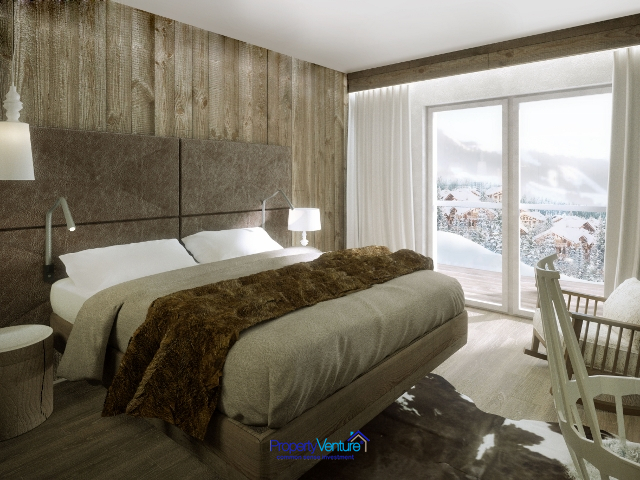 It will have ‘green’ environment credentials, with wood burning heating and thermal insulation. 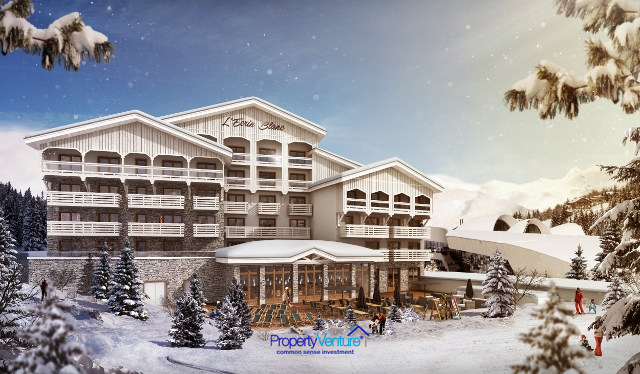 On site facilities include a fitness centre and an Alpine garden, as well as local ski-slope access from the hotel. There are of course the standard four star hotel services like a restaurant, but this one will have panoramic mountain views. There will be private reception and lounge areas too. Private direct access to l’Aquamotion the biggest mountain aquatic centre in Europe via a dedicated tunnel. Its breadth of activities means it offers something all-year-round, indoor and outdoor pools, water skiing facilities. Access can be via Geneva airport, or Lyon's airport. Or by train – there is a train station SNCF Moutiers by Courchevel. Yields of around 3% are achievable, with income paid quarterly to investor owners. The property is fully managed on your behalf, with rental income indexed and reviewed each 3 years. You get ther best of both worlds, a ski pad, managed for you, with income so it won't drain the bank account. A specialist subsidiary of a group which has been managing 4 and 5* tourist accommodation for 20 years. It has wide-raning experience in tourist spots in France. NB Images are visualisations given the off-plan nature of these units.